Larne boss David McAlinden has committed his future to the Inver Park club. McAlinden, who took the Reds to within a single goal of the promotion-relegation play-offs, has spoken of his desire to build on the work he has put in over the last two-and-a-half years. 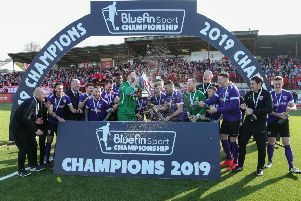 “I met the chairman a few times over the weekend and we discussed things and I’m happy to go again,” he told Larne’s website. The club has also confirmed that a number ofthe current squad have already signed up for next season including Kevin Bradley, Chris Rodgers, Anto McGonnell, Samuel McIlveen, John Donnelly, Scott Irvine, Eoin Gillan, Thomas Robinson and James McCabe.